North Korea fired a ballistic missile over Japan into the sea in an aggressive test Tuesday, prompting scathing criticism from Seoul and Washington just one day after the allies sought to renew hopes for a return to dialogue. 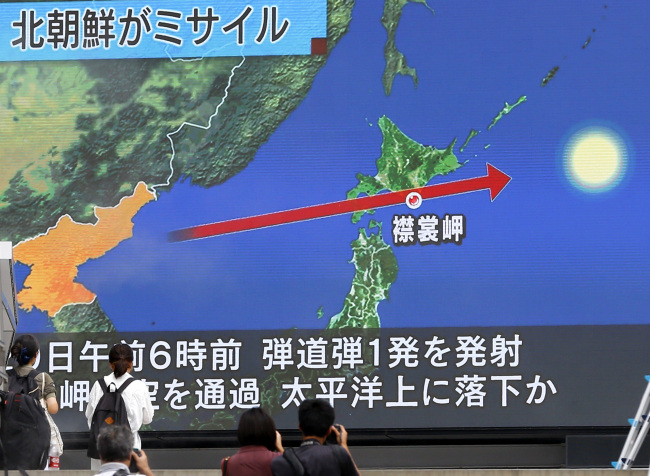 Launched from Pyongyang’s Sunan area at around 6 a.m., the missile flew some 2,700 kilometers and reached a maximum height of 550 kilometers before falling into the northern Pacific Ocean via the northern Japanese island of Hokkaido, Seoul’s Joint Chiefs of Staff said. The JCS appears to be considering the projectile to be the Hwasong-12, an intermediate-range ballistic missile successfully tested last May, though a detailed analysis is under way. 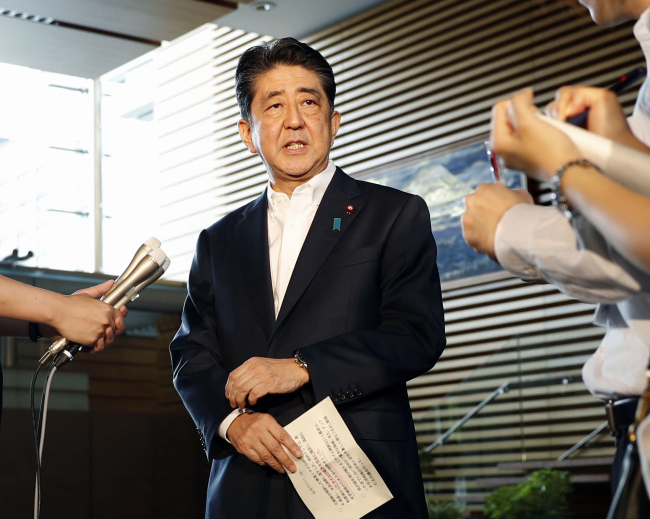 Japanese Defense Minister Itsunori Onodera shared the view at a meeting with reporters in Tokyo, citing the missile’s flight distance and other features. “We assess at this point that it was of the midrange ballistic missile class,” a military official here told reporters on customary condition of anonymity. “We believe the provocation was to stage a show of force against the South Korea-US Ulchi Freedom Guardian exercise, show off its capability to strike US bases and create strategic circumstances that are in favor of themselves,” the official said, referring to the ongoing joint military drill. In the May experiment, the Hwasong-12 was fired at a sharp angle, traveling around 780 kilometers and reaching a maximum altitude of 2,110 kilometers, which means its range may hover from 4,500-5,000 kilometers. This time, however, the North did not launch it at a regular angle -- for its first time for an IRBM and apparently to examine its re-entry technology in a more actual combat environment -- the official said. If confirmed true, the choice of the missile could also reflect the Kim Jong-un regime’s resolve to highlight that it is capable of realizing its recent threats to strike Guam, some 3,300 kilometers away, with the Hwasong-12. Japan’s NHK TV also reported the missile separated into three parts, triggering speculation that the North may have used a multi-warhead vehicle. Kim Dong-yub, a former Navy officer and now professor at Kyungnam University’s Institute of Far Eastern Studies in Seoul, said together with the Hwasong-12, there is the possibility that the missile was the Hwasong-10 or Pukguksong-2, each capable of flying about 3,500 kilometers and 2,000 kilometers. Another striking element is that the launch took place at an airfield in Sunan, where Pyongyang International Airport is located, which would help speed up the preparations and make it harder to be spotted such as from a satellite. Seoul’s National Intelligence Service said it was the first time that North Korea launched a missile at an airport. “It takes time when you set up a launcher at a normal battlefield, but an airfield is built with asphalt pavement so it would boost mobility while taking more time for us to detect it. It was a bold choice for Kim Jong-un,” Rep. Lee Wan-young of the Liberty Korea Party told reporters after a closed-door briefing by the spy agency. He added that the NIS said it could not be verified whether the re-entry was successful. The test quickly dampened cautious optimism that Pyongyang could defuse tension and move toward talks especially after it carried out relatively less intense short-range missile launches Saturday. South Korean Foreign Minister Kang Kyung-wha and US Secretary of State Rex Tillerson have since separately relayed hopes for a shift in North Korea’s current course of action in the near future. President Moon Jae-in, who has been nonetheless talking about the need to revive dialogue, instructed the National Security Council to convene shortly after the liftoff and the military to demonstrate its “overwhelming capability of punishing the North,” his press secretary Yoon Young-chan said. Less than two hours later, the Air Force carried out a live-bombing drill in Gangwon Province near the eastern inter-Korean frontier. Four F-15K fighters dropped eight 1-ton MK-84 bombs, precisely hitting the target designed as Pyongyang’s leadership, the Air Force said in a statement. 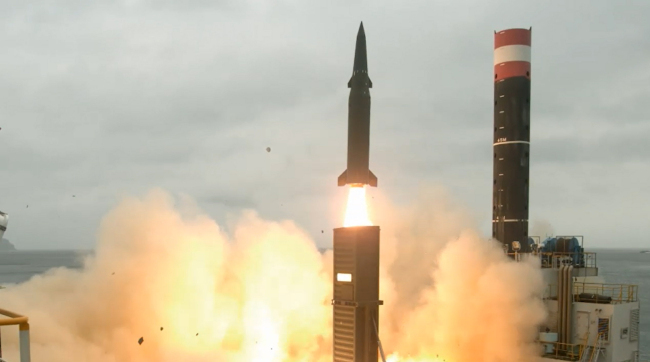 The Agency for Defense Development, a state-run weapons maker, released rare footage of its final tests last week of newly built 800-kilometer and 500-kilometer ballistic missiles. The 500-kilometer missile, in particular, is key to “accurately penetrating and destroying core facilities all over North Korea,” the ADD said. South Korea and the US are also considering an additional display of force here involving US strategic assets such as the B-1B strategic bomber. Chung Eui-yong, chief of the National Security Office, had phone conversations with US national security adviser H.R. McMaster following the NSC session to evaluate the situation and coordinate their responses. Kang, for her part, held phone calls with Tillerson and her Japanese counterpart Taro Kono, respectively. Tillerson said he was “extremely disappointed” that Pyongyang pressed ahead with the missile launch despite its offer of talks, Yoon said. China, Pyongyang’s top diplomatic and economic backer, also criticized the event, with Foreign Ministry spokesperson Hua Chunying calling it a “clear breach” of UN Security Council resolution and calling for restraint. In New York, the UNSC will kick off an emergency meeting later Tuesday upon a request of the three countries, Foreign Ministry spokesperson Cho June-hyuck said at a news briefing. Japan issued stern condemnation as the launch is believed to be the North’s first attempt to send a missile over Japan, other than past space satellite rocket liftoffs. “The NSC strongly condemned North Korea as it once again violated UNSC resolutions by firing a ballistic missile despite the international community’s stern warnings,” the secretary told reporters.